Wisdom Publications (MA), 9780861715442, 212pp. When it comes to business, everyone wants to do well. But can we do good at the same time? Lloyd Field (and, indeed the Dalai Lama, who provides the foreword here) says, unequivocally, Yes. Field's Business and the Buddha lays out the guidelines for putting ideas about individual and corporate social responsibility into practice without sacrificing the bottom line. No longer can business - big or small - afford to focus solely on profit. Real assessment of a business's worth must take into account its consideration of our shared human values, and the realities of our shared planet. That doesn't mean a business can't or shouldn't compete; it means that investing in efforts to build a better society can be, on many levels, an asset. 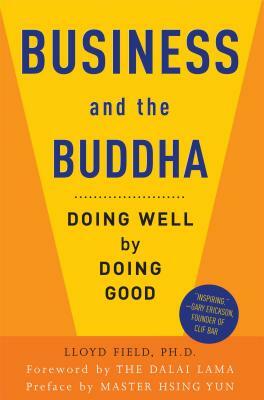 Drawing in a substantial and sophisticated way on traditional Buddhist teachings, Lloyd Field shows how decision-makers and entrepreneurs can achieve new levels of happiness and security both inside and outside the company, and take a power-position as a force for positive global change. Lloyd Field, PhD, left his position as a corporate Vice President of Human Resources at Johnson and Johnson International to build a new career in Organizational Development and Human Resource consultancy. His clients have included many Fortune 500 organizations and his management development and training audiences have include more than 20,000 managers in North America, Europe, and Asia. His current focus is on helping senior executives solve business problems through Buddhist-influenced coaching and counseling. A classic connector in the Malcolm Gladwell sense of the word Lloyd has sold over 10,000 copies (in Canada) of his previous book on positive employee relations-that book is soon to be in its fifth edition. Lloyd has been interviewed on TV (CTV, City TV) and radio (CBC Radio: As It Happens) on numerous occasions. He is currently on the founding committee of Sarvodaya Canada, an organization committed to promoting community development. As well, Lloyd is the former President of the Board of Nalanda College of Buddhist Studies. Master Hsing Yun is the founder of Fo Guang Shan-an international Buddhist order with temples worldwide-the affiliated Buddha's Light International, and University of the West in Rosemead, California. Born in 1927, he is a forty-eighth patriarch of the Lin Chi (Rinzai) School of Zen Buddhism and lives in Taiwan. Tenzin Gyatso, the Fourteenth Dalai Lama, is the spiritual leader of the Tibetan people. He frequently describes himself as a simple Buddhist monk. Born in northeastern Tibet in 1935, he was as a toddler recognized as the incarnation of the Thirteenth Dalai Lama and brought to Tibet's capital, Lhasa. In 1950, Mao Zedong's Communist forces made their first incursions into eastern Tibet, shortly after which the young Dalai Lama assumed the political leadership of his country. He passed his scholastic examinations with honors at the Great Prayer Festival in Lhasa in 1959, the same year Chinese forces occupied the city, forcing His Holiness to escape to India. There he set up the Tibetan government-in-exile in Dharamsala, working to secure the welfare of the more than 100,000 Tibetan exiles and prevent the destruction of Tibetan culture. In his capacity as a spiritual and political leader, he has traveled to more than sixty-two countries on six continents and met with presidents, popes, and leading scientists to foster dialogue and create a better world. In recognition of his tireless work for the nonviolent liberation of Tibet, the Dalai Lama was awarded the Nobel Peace Prize in 1989. In 2012, he relinquished political authority in his exile government and turned it over to democratically elected representatives. His Holiness frequently states that his life is guided by three major commitments: the promotion of basic human values or secular ethics in the interest of human happiness, the fostering of interreligious harmony, and securing the welfare of the Tibetan people, focusing on the survival of their identity, culture, and religion. As a superior scholar trained in the classical texts of the Nalanda tradition of Indian Buddhism, he is able to distill the central tenets of Buddhist philosophy in clear and inspiring language, his gift for pedagogy imbued with his infectious joy. Connecting scientists with Buddhist scholars, he helps unite contemplative and modern modes of investigation, bringing ancient tools and insights to bear on the acute problems facing the contemporary world. His efforts to foster dialogue among leaders of the world's faiths envision a future where people of different beliefs can share the planet in harmony. Wisdom Publications is proud to be the premier publisher of the Dalai Lama's more serious and in-depth works.